For a homeowner, a brown spot on the ceiling is very bad news. It means you have a leak in your roof and the possibility exists that, by the time you see the evidence, you've already suffered some damage. To protect the structural integrity of your home, you want to take care of your roof before it develops a leak. Most residential roofs are covered with asphalt or fiberglass shingles. This flexible roofing material is relatively easy to install and contains granules that help the material repel water. These shingles come in different grades with guarantees often lasting 20, 25 or 30 years, depending on the grade. That means your roof has a limited lifespan, depending on the type of roofing material that was used. For that reason, it's important for you to know the grade of shingle that was used and when it was installed. If you are purchasing a home, the seller will usually tell you when the roof was installed. A good home inspector will give you an assessment of the roof's condition and how many years it has left before you have to start thinking about replacing it. There are also ways for you to keep up with your roof's condition so that you don't get blindsided by that brown spot on the ceiling. Most can be done with a visual inspection from the ground. Walk around the house looking for missing shingles. That's an obvious sign that there is a problem. Other signs include a dull, flat appearance. The granules should give the shingles a shiny surface. When the granules wear off, the shingles lose a lot of their water-shedding ability. When the edges of the shingles begin to curl that's also a bad sign. Curling is usually the result of poor ventilation or a dried-out asphalt shingle base. When you see curling, it's usually time to replace the roof because once this process begins, there really isn't a way to reverse it. Another sign that the roof must be replaced is when you find cracked or bubbled shingles. Many home repair experts recommend staying off a roof with shingles damaged to this extent. They are likely to break or come loose, not only furthern damaging the roof but possibly causing you to lose your footing. Moss growing on your shingles is another bad sign that could means it's time for a new roof. Moss needs moisture to grow, and if your roof has moisture it means the shingles are no longer doing their job. However, before deciding on a course of action it may be wise to first remove the moss and determine the condition of the shingles beneath it. Sometimes you may find one or two missing or damaged shingles. That poses a problem for the integrity of your roof but doesn't necessarily mean the entire roof needs replacing. It will depend on the condition of the remaining shingles. Temporary tar sealing will work in the short term but is not guaranteed to fix the problem permanently. To replace a shingle, slip a flat bar under the damaged shingle and pry out the nails that hold it in place. Next, pull out the old shingle and slip in a new one. This isn't always easy. To nail down the new shingle you must lift the shingle that's directly above it. That can be a problem when the old shingle is so brittle that it doesn't bend, giving you no room to nail the new one into place. If you decide it's time to replace your roof, get several estimates. Make sure the estimate includes removing the old shingles and disposing of the debris. 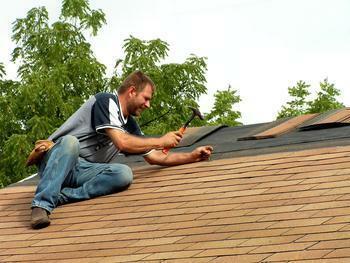 In past years, it was common practice to simply nail the new shingles over the old ones. The industry has changed and reputable roofers won't even offer this as an option. In fact, doing so will void many manufacturers' warranties. What should you expect to pay for a new shingle roof? There are a lot of variables, including where you live, how many layers of shingles are currently on your roof, the square footage of the roof and the pitch. According to real estate site Zillow.com, a complete roofing system with tear off and disposal of all job-related debris could range from $6,500 to $15,000 on a 1,600-square-foot home.